Home listings with neutral wall colors accented by dark pops of color can sell for up to $6,000 more, according to Zillow analysis. This article originally appeared on our sister site, BUILDER. The right paint colors can have a significant impact on the sale price of a home, according to Zillow's 2018 Paint Color Analysis. Homes with black front doors, tuxedo kitchen cabinets and periwinkle blue bathrooms sell for as much as a $6,000 premium. 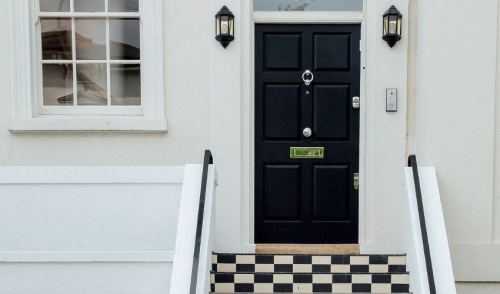 The analysis found that homes with black or charcoal gray front doors sell for $6,271 more than expected, the highest sales premium of all the room and color combinations analyzed. Tuxedo kitchens, or kitchens where the upper and lower cabinets are painted in two different colors, sell for a $1,547 premium. White cabinets contrasted by a dark navy blue or black kitchen island were some of the most common tuxedo kitchens in top-performing listings. Homes with cool, neutral wall colors, which have a broad appeal with buyers, also sold for more than expected. Periwinkle blue bathrooms added $2,786 to sale prices, and light taupe colored living rooms sold for $2,793 more. The analysis found style-specific colors like brick or raspberry red kitchens actually deter buyers and sell for $2,310 less than expected. Homes with brown dining rooms sell for $1,684 less, and yellow exteriors can knock $3,408 off an expected sale price. "For a seller, painting a front door is one the least expensive home prep projects, but also one that can have a powerful impact on a home's sale price," says Kerrie Kelly, Zillow home design expert in a news release today. "While cool, neutral wall colors like tan and light blue are still popular, we're seeing a notable shift in home design where pops of color – particularly in darker hues of blue and gray to even black -- are becoming increasingly popular. Contrasting colors, especially in kitchens and home exteriors add interest and dimension to a room that plays very well in listing photos and videos." The analysis looked at more than 135,000 photos from sold homes around the country to see how certain paint colors impacted their sale price on average, when compared to similar homes with white walls.